The Zellmar Bros. 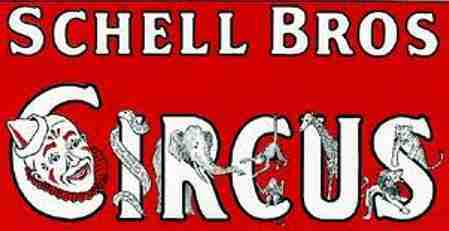 Circus and Schell Brothers Circus were operated by George Engesser out of Saint Peter, Minnesota. George Engesser 1889 - 1962 was a piano player in a music store. A vaudeville show came through town who needed a piano player and hired George to travel with them. After working with the vaudeville company George took out his own traveling repertory and comedy show. The show worked under canvas and was titled "The Two Oles". The show was successful and Engesser opened four more shows. During the winter of 1925 George began to build his circus, he purchased an elephant named "Ruth" from the Hall's Animal Farm and used the best of his tents to open the new circus named the "Zellmar Bros. Circus". The acts that first year included George's daughter Vates, the Irwins doing a high wire, and Kelly & Dorey Miller performing a tumbling act. The next season Engesser opened the show under new canvas, had added a sideshow, purchased a second elephant "Mary" from Hagenbeck Wallace and hired a young Matt Laurish to work a 6 lion arena act, the liberty horses and pony drill. In later years western movie actor Jack Hoxie and animal trainer Milt Herriot (father of John Herriot) would join the show. The circus grew and in 1928 George decided to change the name from "Zellmar Brothers" to "Schell Brothers". Engesser selected the title "Schell", because he had found a cache of paper (circus posters) which had been printed for an earlier Schell Brothers and never used. George Engesser married Vates Swenson and the couple had three daugthers Vates, Georgedda "Gee Gee" Zellmar andy Roxy.